Disclaimer: “Disney” names and images and Bambi images are the copyright, trademark and property of Disney. All rights reserved. 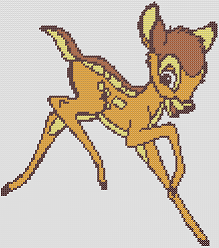 Cross stitch patterns found in this site bearing the Disney and Bambi names and images are for personal use only. Adorable animals are just irrestitable, so what better way than to get your hands on one of our free cartoon character cross stitch patterns from Disney’s Bambi. This 20 cm-sized pattern is made simple and features only four colours, making it the perfect choice for needlework beginners, and anyone looking to create a baby item knitting project such as baby shirts, pillow cases, little throw-overs and more. Your imagination is the limit! Each of our pattern conveniently includes a color key and sheet. If you use one of the free cross stitch patterns from CrossStitch4Free.com for a project, feel free to contact us and include a picture of your completed project to be included in our web site. Download Disney’s Baby Bambi Cross Stitch Pattern zipped file (approx. 137kb — downloaded 229 times). Please DISABLE your pop-up blocker to access this. Please remember — ALL of our charts are password-protected. When you are asked for a password, just type in “crosssstitch4free” without the quotation marks. We appreciate it if you share or distribute this pattern with your friends by adding a link in your social network, instead of hosting this file in a file sharing website. Please read our Terms of Usage in our main page on how to properly use the cross stitch patterns in this site. You can register for free updates by subscribing to our e-mail updates or by adding our website RSS to your feed reader.